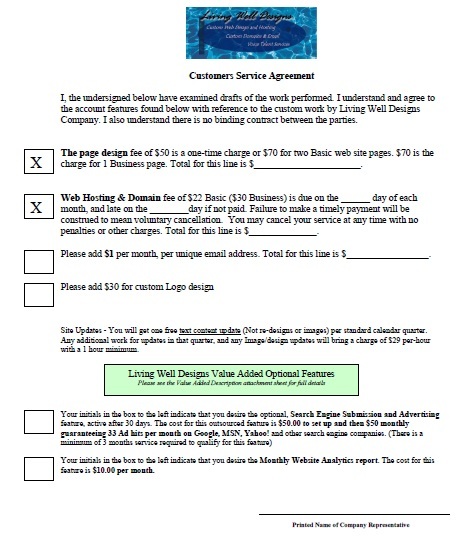 Living Well Designs, Home of the Great $50 Custom Site! Hobbyists value the low cost for the beginners Website. $50 per page gets you a Custom Site including unlimited linked documents, external Site links, Hosting is only $20 per month and Custom Domain is $2 per month. Add a Custom Email address for only $1 per month. Business Website. Cost is still only $50 per page. Hosting for Business Owners is only $30 per month with the same $2 domain fee and $1 per month for Custom Email addresses. Business Sites include PayPal functionality, enabling online payments from your Customers. Trust Living Well Designs for Excellent Websites and high-quailty Voice Services from our newly-renovated Recording and Production Studio. Rely on our 15-years of experience with satisfied Website and Email Customers. Choose The Package and the Services that best fit Your Needs And Your Budget. Living Well will work with you as you grow in your Business needs and your Hobbies as well! Get Internet Website Presence Today !